Two weeks ago, I got this cutie to help me share some thoughts on figuring out if he/she is the one. You guys seemed to approve of my helper. :) I asked him to come back today for Part II. We came up with a list of marriage tips we want to share with you. At our wedding, we had one of those anniversary dances. Do you guys know what I'm talking about? Every couple gets out on the dance floor and the DJ calls out years, "If you've been married for less than five years, you can be seated." And on and on again until just a few couples remain. During our big dance the last couple dancing was Tab's grandparents. I can't remember now how long they'd been married at the time but the DJ went over with a microphone and asked them for their best piece of marriage advice. Tab's grandpa responded this way, "The man should always have the last word- Yes, ma'am". :) It was at that exact moment I knew his grandfather would always be one of my favorite people. I'd like to end the marriage advice right there. Men...you get the last word and it must ALWAYS be, "Yes, ma'am". Tab and I are NOT perfect. We disagree. We argue. We don't always see things the same way, but let me tell you what we DO do...we work it out. If we're disagreeing about something we COMMUNICATE and come to a compromise or agreement. Right after I had Ebby Lee (and quickly became pregnant with Nixon), I began staying at home while Tab held down the financial fort. I must tell you staying at home with two littles was tough. I did this a lot..."I fed him the last bottle", "I've already changed five dirty diapers today", "I cooked dinner while holding a baby" when he got home from work. I was a SCORE KEEPER and I forgot NOTHING! I was only thinking about all the things I was doing. Was I taking into consideration the fact that Tab was working hard every day to make sure we had a shelter over our heads? Absolutely not! Thankfully, I figured out my score keeping was doing no one any good and I stopped. Think about your spouse and put yourself in his/her shoes every once in a while. I try my best now to thank Tab whenever I can for all the things he does I know he'd prefer not to do. For instance, during the summer when I'm at the pool with our kiddos I'll send him a sweet text thanking him for working hard so I can be hanging at the pool with our kids. Would he rather be at the office or at the pool? Hmmm....that's a tough one. ha! We are human. We're gonna mess up, so when your spouse does-forgive him/her and move on. I must add...I'm talking about inconsequential things. Don't hold a grudge about something small. Life is short...forgive and move on. Do you guys remember this image from youth group or college days? I do! But I must add that it's so true! When my spiritual walk is suffering, my marriage usually isn't the best it can be either. They go hand in hand. Tab and I do our best to keep our relationship with Christ as the number one priority. That helps everything else fall into place. Again...we are NOT experts, but we try our best everyday to make our marriage a priority. We're in this for the long haul so we want to make it good. Right? I would LOVE to hear your marriage tips. Please, please, please SHARE them with us! And we'd love to do a "We're Talking Marriage Part III". Do you guys have questions we could answer? 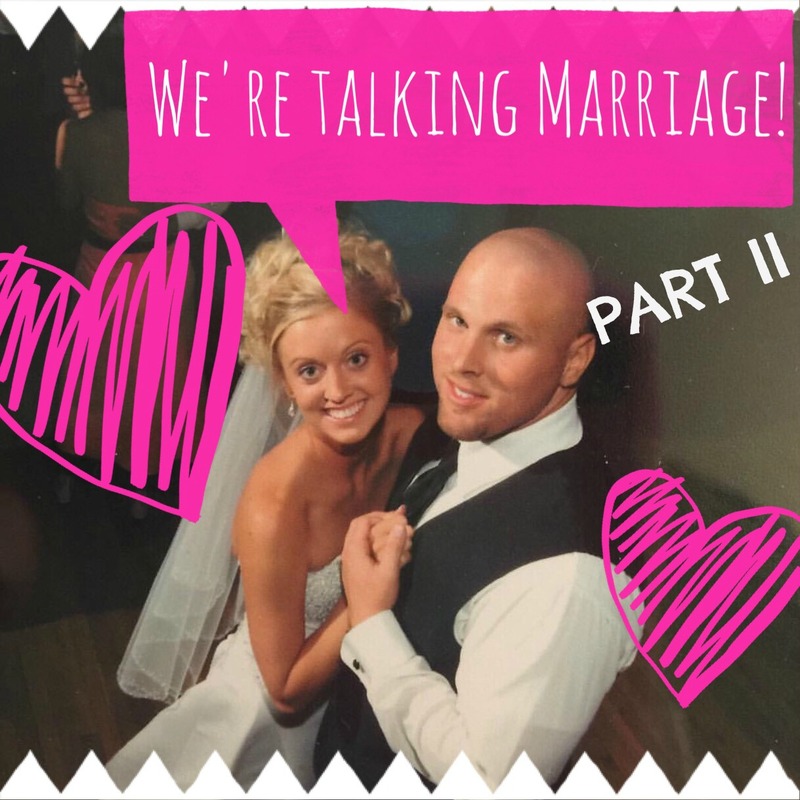 A Marriage Q and A sounds fun, huh? Please leave us questions in the comments or e-mail us @alittlebitofeverything83@yahoo.com. Such great tips! I love the triangle graphics because they really help put it into perspective. So glad you did these posts! Love this! We need marriage help after this weekend... I'm going to need you to go see what my sweet husband did to my son's hair. Ahh! These are the moments we will laugh about...eventually! Haha! Love this advice! Great tips! I was a score keeper, too. Not effective, haha! I think it's important to treat your husband with respect... if he's cleaning something or feeding the kids but not doing it the way you would do it, don't shame him or nag. Praise him for pitching in and get over it! Otherwise, he will never want to help. Also, I'm a HUGE believer in having a little check up time with a trusted counselor/pastor, etc. It doesn't mean anything is wrong in your marriage, but it's helpful to sit down with a neutral party and be able to speak freely and kindly. Oh, and DATE NIGHTS. Whatever you need to do, have alone time with each other at least monthly to reconnect and in that moment, be more than just mom or dad. Haha, Ok, I wrote a novel. Sorry! Can't wait to read everyone else's tips! I love the graphic you shared--it's so true! I find that our marriage is much smoother and we're much more selfless when we are both close to Christ. I love your tips! I'm a firm believer that great marriages are the result of hard work. Marriage isn't always easy! Communication is so so important and as a mom to 5 I know what it's like to be dead tired at the end of the day , but you're so right, staying connected and making the time for your spouse is so super important. Mark is all about having time for just us, no kids just us. For so long I put my kids at the center of everything and he pointed out to me that we can still be awesome parents and still take time for us and not feel guilty. for us we are both appreciative of what the other days, and even though I'm not out earning a paycheck, he realizes that what I do at home is equally as important. It really is a great feeling knowing you're loved and appreciated by your spouse. And tabs grandparent....smart man! Great post today!!! These are such practical tips! I too used to be a score keeper, but when I realized I was doing it, I though about how horrible I would feel if he was doing the same with me! I think being vocally thankful is so important too. Great post! I've never seen that triangle between husband, wife and God! ! I loved that- it's such a PERFECT visual. Thank you for passing that along to us! I'd say Date Night is an important thing to do in keeping a marriage happy. (but my love language is "time") . Tim Keller has one of the best books on marriage. It's a great read. Also, counseling does not necessarily mean a marriage is falling apart but the fine tuning with an objective ear is valuable. Date nights! We try to get away just the two of us once a week. Investing in a babysitter is well worth it! Earlier in our marriage we couldn't afford babysitters so we would plan date nights at home. We would put the kids to bed earlier, open a bottle of wine and cook together/watch a movie/play card games. We did whatever was needed to focus on each other each week. I've also heard of this, but we haven't done it...probably bc I know I would lose (ha! ): when you are on your date, work/kid talk is off limits. First person to accidentally bring it up owes the other $5! I had never seen the triangle graphic...I love it. Thanks for sharing! Love this, Erika! I had never seen that graphic but it is a keeper! We do a "traveling journal" that is really fun. It is just a plain journal that I covered with pics of just us. You take turns & once a week write a short note...could be anything- a joke, a memory, encouragment, etc and then you hide the journal for your spouse to find. So at 6am when I am up to take a shower and open the shower door and see the journal laying there...I just smile! Then the next person has a week to hide it. Sometimes we both forget to write in it and we might go a few weeks- but that makes the surprise even more fun when you find it hidden in the diaper bag, fridge etc! We have been doing it for awhile and it is also fun to go back and read what we have written over the years! I also read somewhere once that you always need to have 3 pics on display in your house: a dating pic, wedding pic, and current pic of just the two of you. That can be hard to do without kids! But I love changing the current pics out. Happy Monday! There's a marriage bible study called Passion Pursuit that is just AWESOME, especially, like you said, for moms of littles, in that "I just want to put sweatpants on and not be touched" stage, haha. Seriously, so good. Similar to score keeper is my need to "win" arguments. I realized that when I don't try to win the argument, then we don't actually argue about anything. It is a work in progress and I am in constant need of this reminder. This is a great post! I've been married 3 months and we never lived together, so needless to say it's an adjustment that we are figuring out! I really needed to hear some of these! Great advice. All those tips are really true! I've learned he closer you are to God, the closer you are to your spouse (that graphic is perfect). Date nights!!! I can tell when we don't make intentional time to be alone. It's essential and babysitters are worth every penny. We've also connected with another couple and we've been switching off watching kids so we can save money too!!! I love this topic! I love marriage and working to make it the best it can be. My husband and I work on the "marriage is 80/20" mentality! For us, it isn't ever about being equals, but about sacrifice! Sometimes Chris needs 80% of me, sometimes I need 80% of him. The key is communication & being aware enough to recognize the other's needs. Sacrificing out of love & desire. Much like Jesus did for us! Such great advice! I agree with everything you said. Such great tips. I feel like you basically already said this, but we really try to put the other one first. Even when we are arguing, we're still trying to be careful about HOW we say what we need to say so that it hurts the other person the least (or hopefully not at all)! And I also agree about noticing the little things they do - Neither of us have it "easier" than the other 100% of the time, we just have our own roles and we work together to accomplish what's best for our family, and remember that we're on the same team. I have been married almost 24 years, an empty nester the past two. Remember everything is a season. It is hard when you have littles always needing/touching you, the last thing you want is the same from your husband. Don't be afraid to say, "Not tonight", have him help put the kids down for a nap on the weekends and then "nap" with him. Over time things (and your hormones) will change. A couple of years ago I had a conversation with my then 17 year old son where he kept reassuring me that it was good that we could still "do it" at "your age" (41/43), but maybe we could send him out to walk the dogs or put a sock on the door as a signal. LOL, we thought we were being discreet one Saturday morning while he was sleeping in...busted! More recently we have been challenged with the "better or worse, in sickness and in health." Just as we broke ground on construction on our property in September I became ill with shingles complicated by post herpetic neuralgia, and more recently (8 weeks ago) a broken ankle. My husband has had to step up with the cooking and cleaning (as well as animal care) while I have had to relax my standards and just be grateful he is doing enough to keep us afloat even though it is not how/as clean as I would keep it if I could. Finally, remember it is not all about you. Sometimes your spouse might be stressed about work, other relationships, etc. Make home and inviting place to rest and give him a bit of grace when needed. Be present and a listening ear, but know that sometimes it is not you and what you have done/not done that is an issue. I love these and would have to agree on all the tips as well!!! Love your sweet family!!!! Great tips! I'm getting married next year and I know I will keep these in mind for a very long time.